"The daily news is filled with reports of racism, sexism, ageism and absurd-ism but a large faction of this country’s population silently faces a form of discrimination I like to call anti-caninism. That’s right, people who hate dogs. You know the type; distinctly anti-social, but ultra-sensitive to child safety, hypothetical allergies or the physically challenged, as long as the disability doesn't require canine assistance. Wherever dog owners gather, there is inevitably, some scowling curmudgeon hiding in the bushes taking video of puppies peeing on grass. Oh no! Now, we've exposed the children! For centuries, scientists have been mystified by the various causes of disease, but ‘Pooch Patrol’ has connected it all to dog urine. Parents beware: Your local park has not been sterilized for your kids’ protection. We belong to a culture spoiled by the freedom to dismiss ourselves from all responsibility. Parents use children as the excuse by which to perpetuate their own ignorance, and we spout improperly learned notions as universal truths. Now, I’m not implying that the enlightened 19-year-old at 7-Eleven is not thoroughly versed in Canadian law but I recently entered one while holding my 10-pound Maltese. Apparently, just having a dog exempted me from the basic courtesies afforded to the general public, let alone patrons. Well then folks, I guess the law is clear. Only it really isn't. Canada’s Animal Pedigree Act prohibits animals from direct contact with food preparation. Beyond that, every province, municipality and establishment owner has their own unique set of rules. Parks, malls and department stores can legally allow your dogs, only many of them choose not to. One manager actually admitted that it depended largely on personality. That of the dog AND its owners. Hound-friendly malls and patios exist throughout Canada, but all it takes one anti-caninite complaint to spoil the show. It’s never about them. These are just selfless citizens doing their part to protect the helpless from your vicious Chihuahuas. Friends, think of dogs as babies. They can be cute, and at times disgusting, but they are part of the population and deserve to share the world with everyone else. 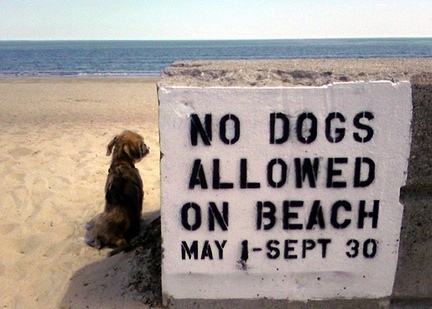 So let’s exercise a little tolerance and open public places to man’s best friend." As a dog owner/pet-parent/dog lover, even I am not blind to the somewhat abrasive tone of this article; so I can understand why some of the reactions and comments to the post have been full of vitriol. However, snarky-ness aside, the writer does bring up some VERY valid points. On the whole, there are no places that Bear and I can go together in the area that we live, outside of the dog park and a few pet-friendly pet stores. Even our local coffee shops (with the exception of one single Starbucks location) does not permit dogs - not even on the patio (enclosed or otherwise). It tends to make socializing a little tricky. For us pet-parents, life becomes a bit of a balancing act. We teeter between making sure that our dogs are not left alone and un-stimulated for more than the average work day, while still participating is the daily social interactions that we, as human beings, require. This is not unlike the daily lives of parents (to human - not fur - babies). However, where they are permitted to take their babies out and about, we are not. It's an interesting shift in perspective - and that's what we ALL need to realize (pet lovers and haters alike). Once upon a time in the not-so-distant past, dogs were work animals and scavengers. They were not brought up in houses or with specially designed beds, pillows, collars and leashes. They were fed table scraps and generic-brand kibble. Not the "organic/grain-free/high-protein/GMO-free/preservative free" food that lines the pet store shelves today. It's a shift that needs to be acknowledged. More people are adopting or buying dogs - not as pets, but as family members. And whether the general population loves it or not, so long as dogs and dog owners (according to Canadian law and health standards) keep away from "direct contact with food preparation" areas, maybe vendors and shop-owners need to start loosening up their stringent rules. This isn't to say that you should be able to walk your dog into a grocery store or restaurant......but a patio? Why not? Or a book store, or a mall, or even a Walmart/Target for that matter....Why shouldn't we be able to socialize with our leashed and well-behaved pooches? ...Who knows, maybe letting our dogs socialize with the rest of the general populace will help reduce the ridiculously high levels of dog-related phobias and social fears.....It's worth a thought, isn't it? to add to the frustration of dog owners is during vacation times .. hotels and timeshare places (majority of them) that wont allow dogs, we personally (as dog owners) want to vacation with our dogs (since they are part of our family), but with hotels/timeshares not allowing dogs in their vicinities, its like impossible to vacation with our dogs. Love the tag line at the end!!! Earlier this year I blocked a woman on Facebook, because she was making me and other dog lovers so angry that I just couldn’t be bothered reading her comments any longer. I live in Western WA and I follow the rules. Our dogs don’t go where they’re not allowed. There are a couple of local beaches with dog areas and we stick to them. If an area is on leash only, we respect that. One thing that we have plenty of are dog parks. We have 100x more people parks so I get frustrated when families bring their toddlers to the dog park. Our dogs chase each other at high speeds with no concern of where my legs are and I’ve been taken out by my dogs on many occasions, because I zigged instead of zagged. So the idea of a 3 year old (or younger) walking around in the midst of this makes me cringe and we quickly see that we made the drive and long walk to the park for nothing, because we’re not going in. I guarantee that if a child is knocked over by my dog, we will be blamed. The woman on FB didn’t understand my concern and called us speciest and claimed that we were trying to make our dogs anti-human parks. She has a right to take her children there, because it’s a PARK. The dog park in my community saw attendance plummet as more families took it over – eventually this changed and I’ve always wanted to know the catalyst. I wish I could take our dogs more places with us; we have three dogs, so it’s just rude on my part to subject everyone to their happy faces, wagging tails, and occasional drool. If I had one dog, I think I might be more tempted to ignore the “no dogs allowed” rule if no one was around. I think (sorry this is so long) that some bad dog parents ruined it for everyone. It only takes a couple. It pisses me off when I step in another dog’s crap that in the middle of the trail (you saw your dog doing that and since you HAVE a dog, you know they occasionally poop, where’s your poo bag???). If I were playing with my family on the beach and we were dodging cow piles, I’d be annoyed too. But does it really happen that much and can’t we shame people into doing their job? Heading over to read the vitriol on the other post. Was it that bad? It's true that there are some very bad pet-parents out there....but on the flip-side, there are also some pretty terrible human-parents out there as well. This doesn't necessarily give anyone the right to judge or stereotype us. Nor does it give them any legitimate reason to dislike the fact that as dog lovers, we WANT our dogs to have more rights and access to the places that we do. As for the comments attached to the article - there was some pretty hefty mud-slinging going on. It was what inspired this response in the first place. 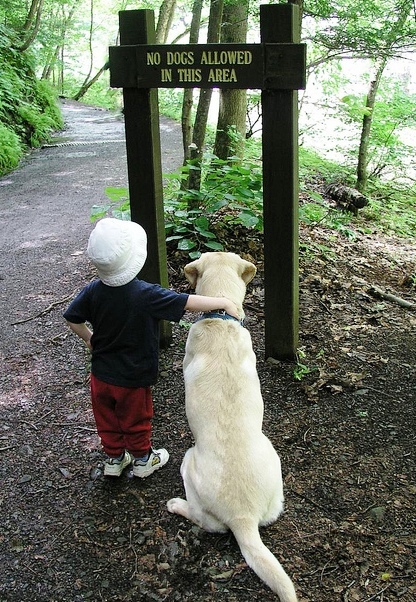 Human children are endlessly more annoying, rude, and loud than our dog children. Ever seen a dog in a store trying to touch anything and everything? No. Would they throw a tantrum in the middle of the isle? No. I will never understand why Canada and US have these rules in regards to where dogs can go. The rules are like they are a danger to the civilization of the country. Living in Switzerland (where there are free dog bag dispensers for all to use)I can take my dog everywhere, The bank, shops, post office, pub, coffee shop and the fancy restaurant as well. Everyone in the country travel with their dog, the country know that these furry friends are part of not only the family but the social structure as well. Last time I checked everyone was quiet healthy with all the dogs out and about. In fact in Geneva, you can't even get a dog until you take a course on how to care for the animal. I live in the USA,washington state.Im not a worldly traveler,but my babygirl and I went every place.stores,doctor appointments,she came to see me when hospitalized,school functions.name it,she was there.i rarely had anyone say anything.mainly just some retarded eye brow action or asking can I pet your pooch.but I had a weapon to those who obviously had no clue about me,if they did no one would have made any peep.i wouldnt say a word but dig out of my purse and shove it in the persons face-her certified service dog certificate.talk about red,embarrased faces and quick apologies.but the ugly I got exposed to is well,no words.ive come to severly dislike humans,more than what I once averaged.